When I was a child many years ago I was taught in sociology as it was then called that the class system was disappearing and that soon there would be no real distinct difference between the classes. There always used to be the upper class, middle class and lower class.. People were put into their place according to status, and public buildings and public transport was governed by this system. You stayed in your place and never the twain shall meet. Along came the yuppie scene and the get rich quick scene brought by and encourage by Thatcher and her cronies… Get rich quick… Buy your council house be better than your neighbours, after all they are only common. Buy as much on credit and the never never, don’t help others, look up and don’t look at those below you etc etc. Of course the rich and aspiring rich enjoyed this and enjoyed luxuries that their parents had never known, buying things and houses with money that they didn’t have. The class system faded away out of sight and behind curtains that the public couldn’t see. Then along came the crash, people got into massive amounts of debt that they couldn’t pay back, people lost their jobs, businesses failed, the economy took a massive dive downhill. And the class system returned yet again. I’m talking about poverty on such an enormous scale that hasn’t been seen since the 1930s and victorian times. I’m talking about such a massive gap between the haves and have nots, a gap that seems unobtainable for most of us. 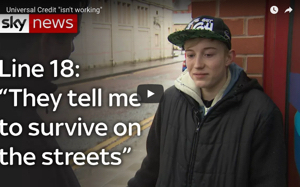 I’m talking about children begging for food, for single mothers having to resort to prostitution to buy their children food and clothes, I’m talking about people committing suicide because of the obscene bedroom tax and benefit sanctioning, I’m talking about people starving to death because the DWP had sanctioned them because they had decided with no evidence that they hadn’t been looking for enough work… A pile of C.Vs and un posted job applications were found beside their bed, I’m talking about wearing shoes with cardboard in them because they have worn out but you can’t afford more, I’m talking about food banks and the ever increasing dependence on them and the governments love of this because it take the responsibility off them, I’m talking about the social cleansing of London and how the brave women of E17 have claimed their houses back…. What I’m really saying is that it’s all wrong and we can change it. Let’s stand up join together and help each other. Loose the attitude that Thatcher gave people, loose the want for material things but find the love for each other, young, old, rich, poor, healthy, ill.
Let’s tell them that it’s all wrong and conquer their evil doings with a love for each other that doesn’t cost anything and that they can’t take away…. Together we conquer, divided we fall…. Brilliant analysis Charlotte! Get it posted far and wide. Quite a lot of people we spoke to at our demos at Stockport jobcentre said, unprompted by us, “We need a revolution soon”. Change will come, a lot sooner than many of the smug members of our society imagine! It would already have started had Scotland voted for independence but there’ll be another trigger occurs. We need to be ready. You’re right – we need to care more. I live in a nice, middle class village, yet my widowed neighbour is still having to support her sick daughter who has been refused benefits because she can lift her arms and legs, despite the fact that she can’t work because she is on such high doses of morphine for chronic stomach pain that she falls asleep as soon as she has taken them. Their savings are steadily dwindling – what are they supposed to do? This is not as desperate as the very real and moving cases you cite, but yes, we do all need to join together for a fairer and more caring society. Well done for reminding us! I have decided to start a blog due to my feelings of frustration that I am feeling because I am poor, perhaps classed by some as being very poor. However I’m not poor in friends, ideas and spirit. 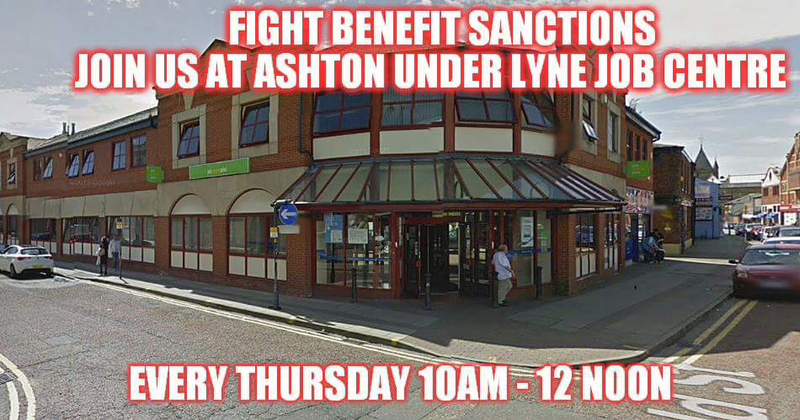 I actively campaign every week outside Ashton Under Lyne Job centre to highlight the way the poor have been systematically targeted by this evil corrupt government. We have not seen poverty like this since the 1930s and it is about time we as a nation stood up against this government. However it isn’t easy, people are demoralised and in poor health so every bit of action helps. If you like this blog, please tell people about it. I think you should set your sights on winning a seat on Tameside Council. A voice like yours in the Council Chamber and the local press (and with the manager of Ashton Jobcentre, who is just trying to ignore you at present) would be a great gain for us all. You got a fantastic start with the 16% vote you got in Hurst ward last May and so many people are fed up with the identikit politicians of the main parties that winning the seat is, in my opinion, a quite realistic objective. I would certainly help with the campaigning. I would love to give it a shot but under the greens it won’t happen. There’s no support and when it was suggested that my ward be put forward for 2015 but without even consulting me said we will get so and so in to represent my ward!!! It upset me to say the least because we do so much and put a lot of effort into it. Well if they want to put an unknown person in and completely loose the vote then it’s up to them but me and the greens might part ways…. Sorry to hear this Charlotte. I find it puzzling that a Party should be contemplating replacing a candidate who lives in the ward, is a known campaigner on issues affecting so many of the electors in that ward, and who scored 16% on a first electoral attempt. I hope you sort this out with Tameside Green Party. I know John they really don’t have a clue. They need a shake up and need to start realising that being in the Green Party is no longer suitable for lazy politics because as you know more and more people are joining and becoming interested in the party. Seems that they want us to fail. Their own words at the last election was “we aren’t out to win”….. Errrr yes we are! !